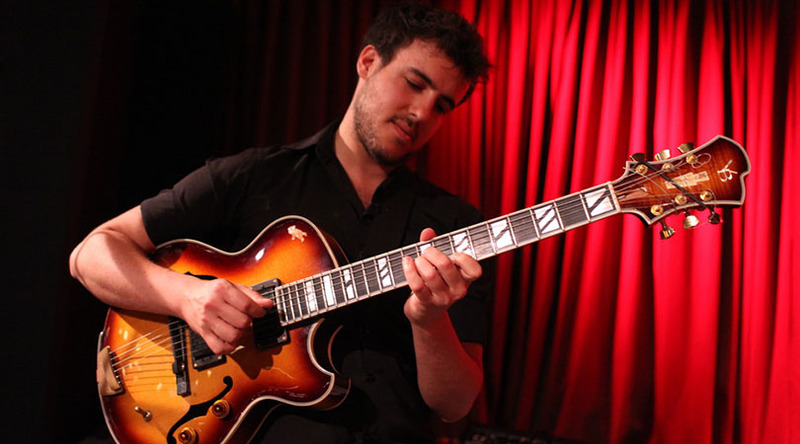 It is often said that some guitarists play their instruments to sound like horns, but Gilad Hekselman plays his as if it were a keyboard throughout his remarkable record This Just In. And he is such an expressive player that it seems his accents and dynamics swing pendulously from hard to soft and loud to sotto voce that he could very well be playing a piano. He also plays in an unhurried manner, dallying over notes as if caressing their overtones; sometimes playing multiple ones as he plays complex triplets and sometimes octaves as well. At other times he would rush a particular arpeggio or a dazzling run as if one note were intended to chase the other playfully; deliberately; to alter the mood of a phrase or line with devastating results. Thus he can move an emotion from plaintive and almost vulnerable to forceful and commanding. Mr. Hekselman’s lines are consequently short and flash across the mind’s ear in short gentle arcs and sometimes they can be longer and furious, like blazing comets that flash across the music’s topography burning through the melody and bringing complex harmonies from tenor saxophonist Mark Turner in its wake. Sometimes they will egg bassist Joe Martin to dance nimbly around the chord, creating dramatic inversions. Mr. Hekselman does both of these things in “This Just In” as he weaves a mesmerising spell around tenor saxophone and double bass. 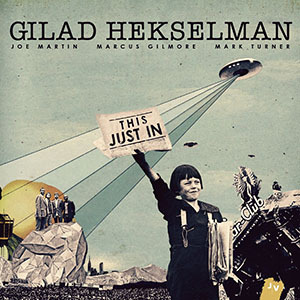 The record in question is actually a suite in which Gilad Hekselman seems to be telling the story in a future time and place. Appropriately his tone is radiant with flashes of brightness that seem to create a kind of glare that causes his images to be burnt with white heat. He also plays in broad intervals that suggest an otherworldly time. Notes on the guitar are accompanied by spectral ones on synths and glockenspiel, which are almost elusive and feel as if they are present only in echo: This on the short beguiling “Newsflashes”. The longer pieces in the suite create deeper narratives in which characters seem to dwell and move just as the notes do: in spiralling motions and often creating pirouettes at the end of skipping steps. Throughout the entire record, Gilad Hekselman seems to also create water colours and canvases of sound to illustrate his musical journey. So wry is the tone of his commentary that he adds colours to match. These are soft and muted and even when they are slightly brighter, these colours are seared; burnt by the blinding heat of the phrases comprising notes and chords that flash across Mr. Hekselman’s imaginary soundscape. What is also remarkable is the fact that when Mark Turner joins him, the musical sheets and canvases feature melting colours that constantly shift and change. Gilad Hekselman has picked his musicians extremely well. Mark Turner—playing somewhat less these days—remains one of the most profound voices on tenor saxophone. Wherever he goes; whatever company he keeps, Mr. Turner brings his poignant erudition to everything he reads and to his breathtakingly beautiful soli as well. Joe Martin plays his large instrument—the double bass—with lithe expressiveness. His is a deep, throaty sound and he can rumble with astounding gravitas. Mr. Martin is a virtuoso player who has wide-open ears and can listen with a sense of telepathy. Here too he plays almost as if the notes come to him in quantum packets of energy. Thus he brings to the guitar and drums a kind of majestic blessing that increases the passion and grace with which the music is annunciated. Marcus Gilmore understands polyrhythms the way Elvin Jones did: with a primordial ear attuned to the echo of a time past. But he hears things in a future time and place. Thus Mr. Gilmore is way ahead of his time, channeling not only Elvin Jones, but also Ed Blackwell and Andrew Cyrille. Mr. Gilmore’s angular attack is also reminiscent of Thelonious Monk’s and so he brings something gloriously edgy to the wonderful music on this record. Gilad Hekselman and his musician companions ought to be very proud of this record. It is superb and ahead of its time; being special in every musical department—melodically, harmonically and rhythmically. Track Listing: Above; Newsflash #1; This Just In; Newsflash #2; The Ghost Of The North; Newsflash #3; March Of The Sad Ones; Newsflash #4; Nothing Personal; Eye In The Sky; Newsflash #5; Dreamers; This Just Out. Personnel: Gilad Hekselman: guitars, synths, glockenspiel; Joe Martin: bass; Marcus Gilmore: drums; Mark Turner: tenor saxophone (3, 9 & 13). Scott Robinson, Julian Thayer: ?